November 10, 1978. The segment on the United States side of the river from river mile 842.3 above Mariscal Canyon downstream to river mile 651.1 at the Terrell-Val Verde County line. Wild — 95.2 miles; Scenic — 96.0 miles; Total — 191.2 miles. 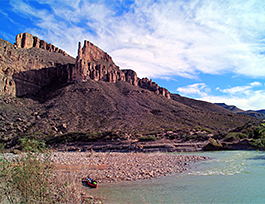 This 191-mile stretch of the United States side of the Rio Grande along the Mexican border begins in Big Bend National Park. The river cuts through isolated, rugged canyons and the Chihuahuan Desert as it flows through some of the most critical wildlife habitat in the country. Hidden canyons, ancient rock formations, millennia of human use, rivers are the very focus of life in the Southwest.